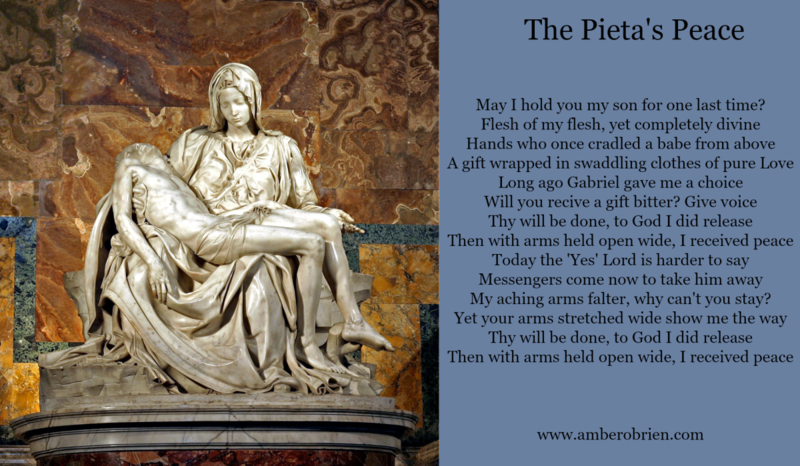 I wrote the poem Pieta’s Peace during a time when I grieved the loss of my brother Billy and my daughter struggled as well at college. When we grieve for ourselves or for a loved one who is struggling we have a choice to pass the test of trusting God and surrendering with open arms those people God has put in our lives for a short time. I couldn’t stop gazing at her hands. Carved from white marble, her hands did not tightly grip her dead Son, but instead gently cradled his limp body upon her lap. Her left hand lay open with its palm facing upward as her beautiful, serene face admired her lifeless son. One of the highlights of our trip to Rome consisted of my husband and I touring St. Peter’s Basilica in Vatican City. St. Peter’s Basilica Catholic Church is one of the largest churches in the world as well as a masterpiece of architecture containing numerous chapels and altars lavishly decorated with renaissance paintings, mosaics, and sculptures. Such a large collection of beautiful art overwhelmed me, as I knew I could never take it all in within a single visit. Despite the numerous pieces of religious art on the ceiling, walls, and even the floors in the massive cathedral that holds the tomb of St. Peter, I felt drawn back to those marble hands. The hands were Mary’s in the masterpiece The Pieta by the world-renowned sculptor, painter, architect, poet, and engineer Michelangelo. The Pieta depicts the moment when Jesus was taken down from the cross and his mother, Mary, was able to hold him one last time. I stared in awe that a sculpture chiseled out of stone could mesmerize a crowd 1500 years later as we stood in silence taking in the heart-wrenching scene. When I had left our home for our trip, my heart felt heavy with concern over one of my children who was going through a rough patch, and this masterpiece seemed to specifically whisper to me through the ages. After watching her son suffer and be crucified, Mary’s hands still rested open as Jesus lay on her lap. Meanwhile, my heart and hands were gripped tightly with fear and anxiety as I worried about our daughter who just recently started college. She did not seem to be thriving socially and wanted to transfer to a larger school that offered more classes in her major. She was attending the school where her father and I had met. A place filled with great memories, but where I initially struggled, too. During my own freshman year, I endured tough hallmate and professor situations and felt that I benefited from these refining challenges. I later thrived as I found like-minded friends and classes that I enjoyed. So while I was on this trip, many questions continued to linger in my mind; “Should we make her stick it out and insist that she stay? Would this put her behind if she were to come home and/or transfer? Wouldn’t the best thing long-term be to make her stay and allow her to adapt in due time? 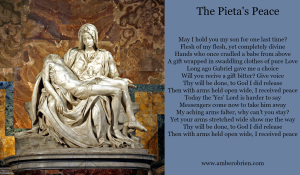 As I looked pensively at The Pieta, I felt as it contained a special message from above, so I decided to read up about Michelangelo and his timeless Pieta. I googled his name and learned that at early age of six, after losing his mother to a long period of illness, Michelangelo was then sent to stay with his uncle who was a stone cutter. After suffering such a tragic loss at a tender age, Michelangelo obviously knew the agony of grief. Perhaps, though, he also learned how God can reconcile loss as he began his career as an artist using the skills he learned at his uncle’s workshop. The word “pieta” literally means “pity, compassion, and suffering.” Michelangelo wrote later, however, that he did not want his Pieta to represent death, but rather to show “the religious vision of abandonment.” Abandonment. Yes, that is what those open hands are demonstrating. I interpreted the scene as Mary trusting in God’s love and goodness and giving back to God the gift that was given to her so many years before. I wondered if the sculpture that took two years to complete was Michelangelo’s gift back to God. Maybe he learned as a young boy the secret of abandonment and found the serenity reflected in Mary’s face. Perhaps he wanted to share with others the peace found when one holds onto people and things loosely. Later in our trip, I reflected on perseverance and remembered the times in my life when not giving up had actually become a detriment. When my children were younger, I wanted us to be a musical family so badly I insisted that me and all three children take piano lessons. I had visions of us all around the piano playing Christmas carols. Each night, I faithfully spent time playing songs over and over, hoping that I would be able to start a musical tradition for our family. Playing with two hands did not come easily, yet I faithfully practiced for two years as I encouraged my children to do the same. I remember one day my piano teacher turning to me and asking, “Do you enjoy playing the piano?” I realized then that I no longer enjoyed it, and that I had hit a standstill in my progression. I asked myself what did I enjoy doing? My answer was writing poetry. I loved the satisfaction of creating a poem – spending hours mulling over each syllable and line, and the inevitable joy when my poem finally came together. Why was I spending my time on what I struggled with instead of spending my time on what I enjoyed doing? Why wasn’t I sharpening the gifts that God had given me instead of trying to force the gift of music he hadn’t given me? Then I asked myself: “Am I doing the same thing now to my daughter?” It must not have been easy for her to ask to leave after one semester. Did she need a fresh start and a new direction? A redo? So I took my hands out with palms up and pretended my daughter was in my arms and lifted them up to the hotel ceiling as I kneeled beside the bed. I released her to God and said, “I give her back to you. She is Yours.” I continued to pray this “prayer of abandonment” whenever an anxious thought gripped me. As my husband and I discussed options, I kept releasing my own expectations as we sought God’s will for her. As I handed over my daughter into His loving, strong arms, I felt peace. Peace as beautiful as Mary’s serene Pieta face as she calmly gazed upon her son. My husband and I decided at the end of our trip to work on helping our daughter to withdraw so she could have a fresh start at a new school. She began anew at a closer, larger school that contained more classes that fit the major that she enjoyed. She now thrives in classes designed specifically for her desired major, as well as socially with the sorority she joined when she transferred. And I am trying to each day to hold my hands with palms open facing up and intentionally release any concerns up to God, trusting that He cares about every little detail. On the entire six hour plane ride home from Italy I joyfully penned The Pieta’s Peace, my small gift presented back to God with open hands and a grateful heart. Pedaling Out to Sea… No Steering Included. Love is like Mushroom Risotto #LovelikeJesus 1. What will you do or not do in 2019? That is the question.